These days it seems that more and more people are planning and planting their own gardens, and using garden bricks in their landscape design. Brick is literally the building block of the country around us. From historic government buildings to old-fashioned homes and cobblestone roads, brick has been in use for centuries. Today, brick and stone still plays an integral part in building, decorating and landscaping design. There are so many ways to incorporate brick into your outdoor space to spice it up and make it even more exciting. Use brick for walkways and garden wall design to make your space more inviting. Line planter beds to create a landscape edge in areas to break up the green of everything. Personally… I don’t think there are hard and fast rules. But there are tons of ideas. Old Bricks And Stone Hiding Under Weeds In the Yard Or Lawn… Created A Stunning Feature Backyard Feature. This homeowner discovered bricks and stones that were supposedly useless to him, under weeds in the back yard. 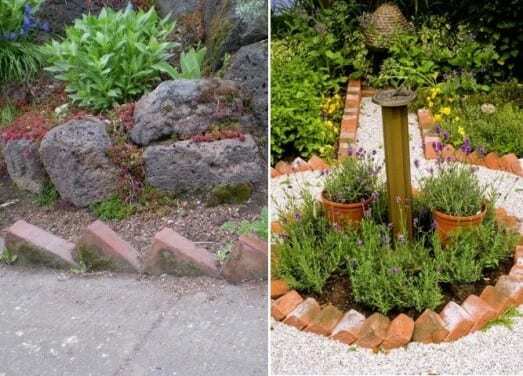 Instead of throwing away, he used them as recycle brick pavers into an attractive patio. He had enough stones and bricks available to reuse and make a brick patio area, built-in fire pit and walkways. Use bricks or pavers one laying flat and another upright to create a simple brick garden edge fencing, retain wall, vertical garden or a “mini brick wall garden” for the flower beds and provide a clear separation from the lawn edge. Create a brick edge! 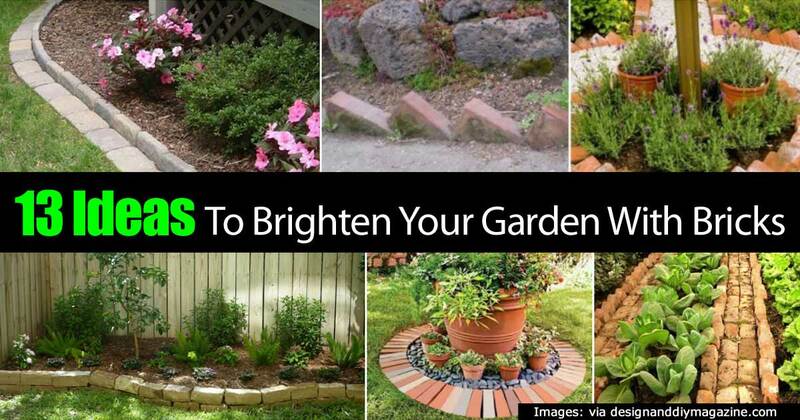 This is a little different way to arrange bricks and create some visual elements to flower beds, surfaces and paths. This is one idea to separate the seedlings in the garden with paths of the bricks. Not sure how practical it is unless you had LOTS of extra bricks! I always find something special about brick pathways. They offer a unique charm I guess. The above image is a brick pathway, the Home Depot has put together, and share their “How To” tutorial on building it. This is a simple landscaping idea but a visually appealing use of brick pavers and stone in the garden. This use of bricks is to create a focal point and not for use as a walkway. Many times unique looks can be created by simply raising the plants or creating different levels. Add some stones to set things off! This is a variation on the “fencing” idea above. Stack several courses of bricks to make a mini stone wall fence or raised garden. This makes for a nice contrast. Make sure to overlap the bricks help them support each other. Concrete bricks can be used as a border for a raised garden. The bricks can then be used for planting pest fighting flowers like marigolds, which can help keep some pest away! Create a “stage” to highlight a large flower pot by placing bricks in a circular pattern larger than the pot. Add pebbles stones and place small flower pots around larger one. One of the best ways to accomplish this look is by using reclaimed bricks! Reclaimed bricks make excellent building material for outside patios and they add a touch of class, elegance and a rustic feel! Concrete bricks or blocks offer lots of uses in the garden and an opportunity to create interesting items… like a garden bed! Just add pillows for comfort and relax! This sweet looking bench is screaming… sit down, relax, enjoy the view. Some bricks and boards or a nice slab of wood… and you have a beautiful garden bench. These bricks were stacked 3 times before they were happy with them! You’ll enjoy when you barbecue on your own created backyard masterpiece. Make it unique and make it your own! The level of creativity people have with their do it yourself projects is completely unreal to me. This man built his own brick stove for only 6 dollars, something which would cost one hundred times that at a store. The best part is that his stove looks better than many of the big box ones. It is a rewarding project and is great for your entire family to work on together. Think about some of the items you could be cooking outside. A great project for getting your creative juices flowing! This project started because their front planter became a “litterbox” for the neighborhood cats. Great solution using brick! This is a simple idea to mark or label plants in the garden. One thing for sure… the birds will not be plugging them out of the pot and flying off!